If you've watched five seconds of the World Cup so far you're sure to be totally annoyed by the vuvuzela, a plastic horn that sounds like a mosquito near your ear. Or 15,000 of them all at once. 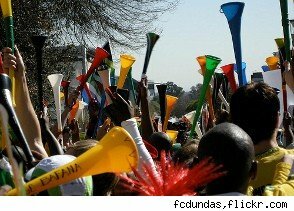 The vuvuzela is an important part of South African tradition, and even as loudly as everyone complains, FIFA might not get around to banning it before the end of the cup. There are a few things you can do to your TV though to minimize the sound or drown it out completely. This suggestion comes from the U.K.'s Telegraph. If your TV is smart enough to have a programmable equalizer setting, you can reduce the 300 Hz channel down to zero, then up the channels nearest to it. A few folks on Twitter have reported that not only does EQ reprogramming not work, but the sound becomes more annoying. We tested it using a sound file on our laptop, and it definitely dampened the sound but didn't remove it completely. This is a cool solution because it relies on a little physics. If you take a sound, then invert its phase (but keep the amplitude), the inverted phase sound will cancel out the original sound. The quickest way to do this is to buy it: Go to the Anti Vuvuzela Filter, pay about $3.60 and get a 45-minute mp3 download. You load that mp3 and pipe it into your sound system, preferably with your speakers right next to those of your TV, and that should reduce the sound. If you want to save the cash, you can use a sound-editing tool like Audacity to roll your own phase-canceling mp3. To do that, you first get a sample of the sound: Do a search on any video site showing parts of the soccer game, then convert it to mp3 using a site like Video2mp3. You then import your mp3 file into Audacity, then make a copy of it. You select the entire length of your copied track, then invert it (screenshot below). Then you delete the source track and export your inverted track as mp3. You put your inverted track on, setting it to replay continuously and it should reduce the irritating hum. Since the fans aren't playing the same exact notes on the plastic trumpets, there will be some variation in sound so the phase inversion won't match exactly. Which is when you mute the TV and put on the theme from "Chariots of Fire." The next thing we need is a way to mute the irritating hum coming from the American soccer announcers. 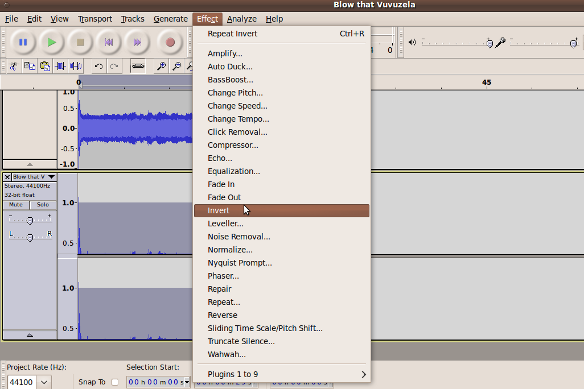 The very simple "invert" feature in Audacity's free music-editing software.